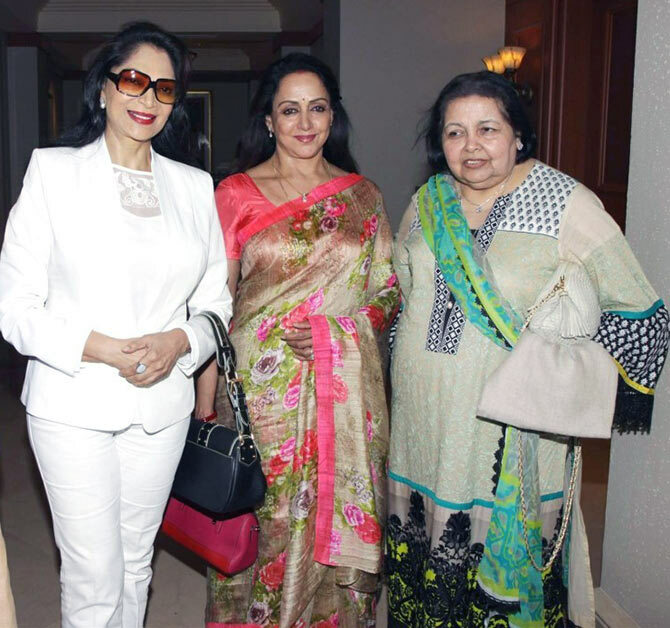 Pamela Chopra, Yash Chopra's spirited wife, is a delight to talk to. She discusses the men in her life -- her late husband, and sons Aditya and Uday Chopra -- no-holds barred, even spilling some secrets. In a long chat with Patcy N/Rediff.com Pamela Chopra gives us rare insights into the Yash Raj Films Dynasty. We know your father was in the Indian Navy and that you are related to Simi Garewal. Can you tell us something about your family? Simi is my cousin, she is the daughter of my bua (father's sister) Darshi. I have two brothers. I am the oldest. My parents come from large families, so I grew up with a lot of cousins. My father was in the Indian Navy, so my upbringing was very disciplined. Our education was also very good, as we were sent to good schools wherever my father was transferred. 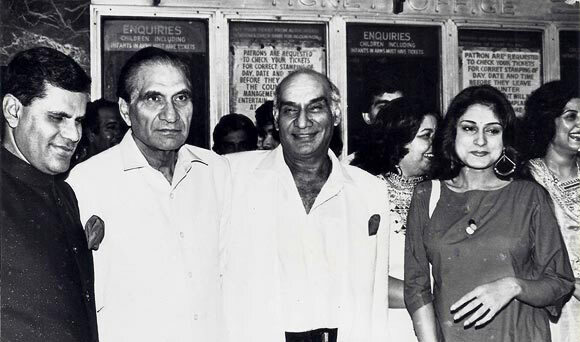 Do you remember your first meeting with Yash Chopra? (Laughs) Oh, yes. I first saw him at this star cricket show in Delhi. Two of my cousins were completely star-struck and they wanted to go for this show. My father, being a military officer, had easy access, so he got us three passes. Yash was seated just a few rows in front of us. My cousins pointed him out to me. Yash turned around and saw us. My cousins were very pretty and you know, he had an eye for pretty girls, so he kept turning around throughout the match. But we did not meet or talk to each other. I think the first time I spoke to him was at Yashji's niece's wedding sangeet. I was in Mumbai for my holidays and staying at Simi's home. They were invited and took me along. They said I would be a great asset as I sing Punjabi songs. I met him very briefly at first. He was too busy trying to convince Hema Malini to do a film. He and Hema were on the balcony the whole time. He came in only when the singing started. I was singing. He came up to me and complimented me on my singing. That was it. Did you know he was a filmmaker? Oh, yes, I was a complete film buff. Every Friday when a film released, we would watch the matinee show. But I was not a Yash Chopra fan; I was more of a Raj Kapoor fan. How did you get married to him? 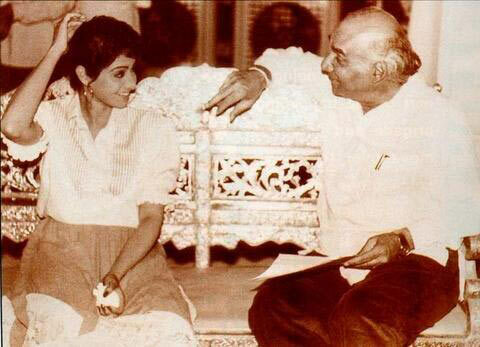 Yashji and I had an arranged marriage. Our families had a common friend in (actor) Romesh Sharma's mother. She had seen me at a wedding in Delhi where I was singing and thought I would be ideal for Yash. She was not wrong because we had a wonderful marriage. She rang up bhabhiji (B R Chopra's wife) in Mumbai and told her about me. As luck would have it, Yash was coming to Delhi for auditions. Romesh and his father came to meet me at work. I was working with British Airways at the time. They took me out for lunch. They did not mention Yashji at all. Romesh Sharma is a very entertaining person and we had a wonderful time. They told bhabiji that I was working, had short hair! Then my parents and I went to meet him. That meeting was a disaster because he wouldn't speak. They left us alone and we did not have a word to say to each other. Yash missed his flight and had to spend another day in Delhi, so another meeting was arranged. This time, it went very well. I saw a completely different side of Yash. He was wearing a lungi and kurta, sitting on the floor and playing a chamach on the dholki and Romesh's sister was playing the dholak and they were singing. It was great fun. We were relaxed because we thought that this match won't happen. When you meet someone for matrimony, there is a certain tension. This time, there was no tension because we had both decided we were not going to go ahead with the wedding. Strangely enough, I started liking him and he reciprocated. Did your views about his films change after marriage? My father had seen Dhool Ka Phool (directed by Yash Chopra in 1959) and was very impressed with it. He felt every girl should watch it. I found it very interesting too. The next film I saw of his was Waqt. I didn't watch Dharamputra, which came in between. When Waqt released, there was a huge hungama (it was a huge hit). Slowly, I realised that he was a very good filmmaker. He had an eye for beautiful things, whether it was scenery, clothes or actors. I liked that about him. Before watching all these Yash movies, my favourite film was Raj Kapoor's Sangam. 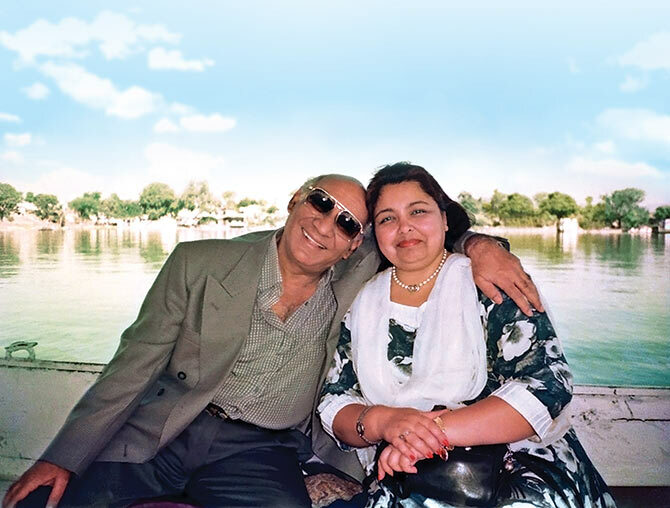 After you married Yashji, how did your life change? All the discipline I had learned I brought to my household. Of course, there used to be story sessions in the house which would upset the routine completely. Four, five writers would arrive early in the morning and sit till late. I had to arrange lunch for all. That was a little disturbing. There were also music sittings at home. I loved listening, but he never invited me to be part of it, so I would be in the bedroom. When he realised I was interested in music, he would play the song for me if he had recorded it. Did it disturb you not having any privacy at home? Yes, but I realised early in my married life that if I want any part of Yash, I would have to join him in his work otherwise I would never get to see him. He was the kind of guy, who, in the middle of the night, would get up and start scribbling something and then go back to sleep. 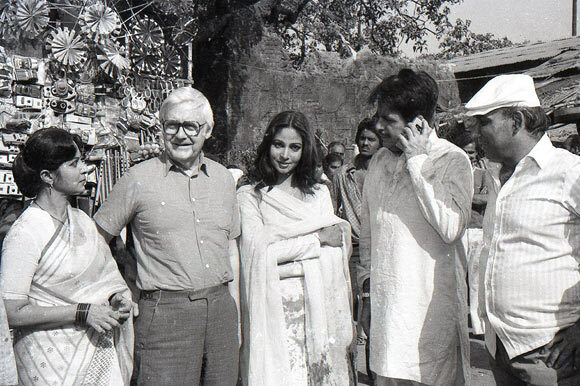 He was very involved with his first independent film (Daag: A Poem Of Love, 1973). Since it was his first film outside B R Films, he had to prove himself. Slowly, he started involving me. Was the split between the brothers a difficult time for you? Yes. Everyone kept telling me not to blame myself for the split. But they always gave me the feeling that I was not welcome, so I thought maybe it happened because of me. Yash would reassure me every time. The unpleasantness had started even before I was married; that was the reason we shifted out of the house. What was Yashji's relationship with his brother like after they went their separate ways? He was completely in awe of his brother, and indebted to him, till the end. Between him and his brother there was nothing. Unfortunately, the sister-in-law (B R Chopra's wife) was not happy with what had happened and the fact that he had moved out. The son (Ravi Chopra) was very upset as well. That led to a certain amount of distance, and we didn't meet that often. They would only call us for major functions. Whenever we met, there would be some coldness. 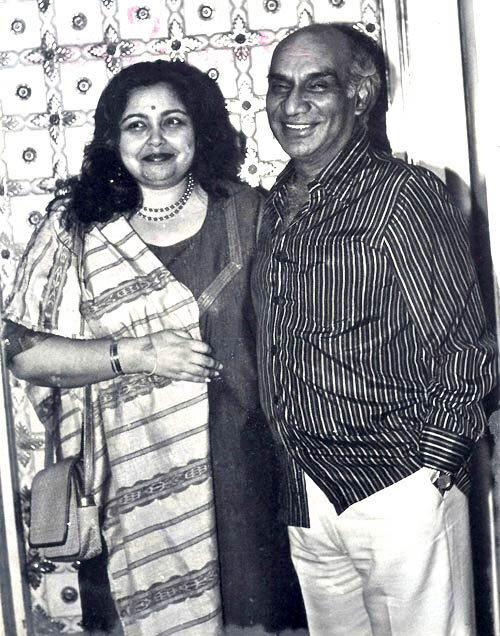 What kind of relationship did you and Yashji share? He seemed like a very romantic man from his movies. He was romantic in his movies, but in real life, he was a very practical man. There was a child inside him, like if he was hungry he had to eat at that very moment. If he was sleepy, he would just leave everything and go to sleep. He was a completely different person at home and at work. At work, he was very efficient, and in control of things. At home, he didn't bother. He allowed me to manage the house the way I wanted to. When he was out shooting, would you stay at home? Yes, I was at home taking care of my two children, Aditya and Uday. It was not difficult at all. I knew he would not be hands on with the kids because he was in his own world. My husband didn't even know what class they were in, never went to a parent-teacher meeting. But I never complained. Did anything about Yash Chopra upset you when you were young? The only thing that would upset me was if he missed birthdays of the children because they were so attached to him. Adi would be very disappointed. It happened once or twice. He never encouraged coming on the sets. Actually in the Chopra family, they never liked their women coming on the sets. We would go on the outdoor shoots. When the children started going to school, they could go on outdoor shoots during the holidays only. Yash Chopra shot many of his films in Switzerland. Why did he love Switzerland so much? Switzerland happened because we could no longer go to Kashmir. That was the only reason. Plus, the infrastructure in Switzerland is so simple that anybody can go and shoot there; you hardly need any permission. In India, if you have to shoot in a train, you have to start the paperwork six months ahead with various organisations. But there, the person who is present at the station is in charge and he has the authority to tell you whether you can shoot or not. Unlike Kashmir, all the picturesque places in Switzerland were easily accessible by road. When a film unit moves, it moves with a generator and so much equipment, so you need that convenience. What was your role in a Yash Raj film? When did you start getting involved? I don't remember because it happened slowly and smoothly. The kids were around 13 years old or so and I was freer. The wonderful thing was that so much of the work was done at home. He never asked me to come to office. Later on, when he saw that I was interested, he would ask me to be part of his project. You were credited for Kabhi Kabhi and Lamhe. What happened was that I had read a story and I liked the idea very much, so I just narrated it to Yash. He decided to expand on it and make it into a film. That became Kabhi Kabhie. The other film was Lamhe. I was fascinated with a story called Daddy Longlegs. It was a lovely romantic book, where a person adopts a girl without seeing her or being seen by her. All that she knew of him or saw of him was his shadow where the legs were exaggerated. So she called him Daddy Longlegs. Ultimately, she falls in love with him and he with her, and they get married. That was Lamhe's basic idea. These were my two contributions (as story ideas). What were your other contributions? Sometimes he asked me to do the costumes. I did all the costumes for Noorie. It had to have that special look, a rough look, but at the same time, it had to look warm. I thought of a mix of khadi, which looks rich and warm, and cotswool, so that the actors would be comfortable. It was easy because they were all wearing salwar kameez. Yes, that was the only film for which I was the hands-on producer. Honey (Irani) and I were working on a story for television. This idea came to us and when we narrated it to Yash, he said we can make a film out of it. So we started working on the script, the screenplay, the dialogues and finally the casting and then the shooting. He asked me to produce it and that's how it happened. 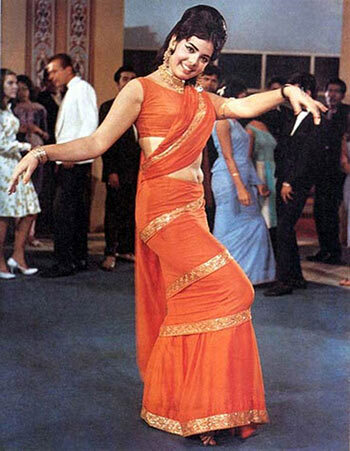 When and how did you start singing in Yashji's films? I don't remember the first time I sang. Whenever he wanted a character to sing or hum on screen, he would make me do it. I don't think I sang a proper song till Kabhie Kabhie. Jagjitji (Mrs Khayyam) and I sang the chorus of the title song, which was later sung by Lata Mangeshkar. Did you ever consider singing for another banner? Nobody else approached me. They must have thought Yash would get angry. If they had approached me, I would have said yes. Yash Chopra worked closely with many beautiful actresses. Did it ever make you jealous? Sometimes, yes it did (laughs). All the pretty ones made me jealous. He would pay them a lot of attention. Later, I got used to it because for Yash his family was also very important. Was there any gossip about your husband that bothered you? Actually, there was more gossip before I got married. There was this gossip that he was involved with this heroine and they were on the verge of getting married. In fact, that was the only question I asked Romesh when he met me. I asked him what is this thing between Mumtaz (Mumtaz worked with Yash Chopra in the 1969 film Aadmi Aur Insaan) and Yash? He said it was nothing. He said Mumtaz is not a filmi, dainty heroine type at all and they are very good friends. He said there was nothing more. That is not the truth, but never mind (laughs). How did he change as the years went by? It was a remarkable change. When I was not married to him, he was an angry man on the sets. Any mistake from anyone on the sets or from the production, and he would fire that person. He was famous for not having lunch breaks when he was shooting outdoors. He was a very hard taskmaster. Who are your close friends from the industry? In the industry, hardly anybody (laughs). I would be close to somebody (during the making of our film) and suddenly would get cut off when that person was working for a movie made by somebody else. If I tried to maintain my relationship with that person, it would not be comfortable. So I realised there was no point doing this. I would just get hurt in the process. 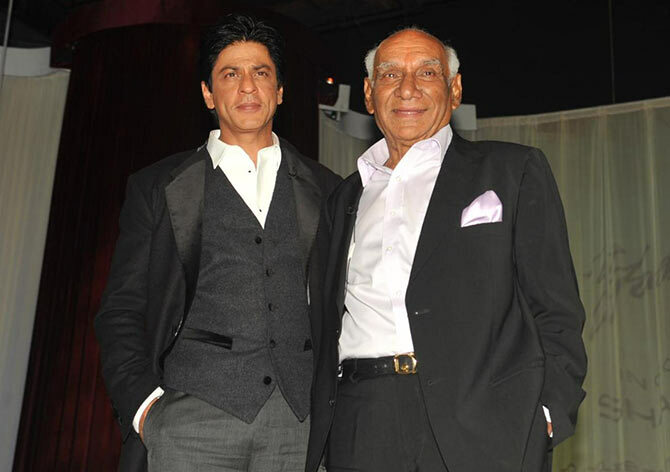 Yash Chopra had a great relationship with Shah Rukh Khan. How are you with him? Shah Rukh and I also have a very good relationship. When he is with you, he is completely yours, once he leaves the room, he doesn't know you (laughs). Actually, he is very sweet. Whenever I ask him to come, he is there. What is your favourite Yash Chopra movie? Of Yash Chopra's, there is not a single one that I don't like. Every time he made a new film that became my favourite. Not because he was my husband, but because I could see his progression as a filmmaker as well as a thinker. He was doing wonderful things.